New York, NY Papers filed in a Manhattan Court today are the beginning of a lawsuit that seeks damages in the tens of millions. Who is behind such a suit, you ask. None other than sasquatch himself. The long-time recluse chose to come out of hiding to defend his good name, a decision reached after much deliberation. ��I just got so fed up seeing that Monster Truck out there engaging in activities that are completely contrary to my deeply held personal beliefs. I decided to come out and set the record straight. The real Bigfoot (that�s me) stands for love, harmony and preservation. This imposter who stole my name has done nothing but damage my public image by equating my name with the alarmingly loud noises and gratuitous violence of the so-called sport of car crushing,� said Sasquatch. Although the exact amount of damages sought in the suit have not been disclosed Sasquatch confirmed to reporters that the amount exceeds 20 million dollars. �He is not doing this for personal gain. Any damages awarded will be donated to charities, mostly wildlife habitat conservation and rehabilitation programs,� Bigfoot�s mom told reporters. 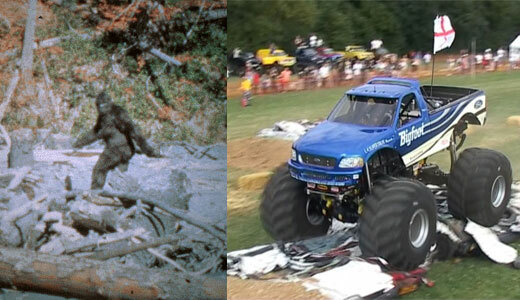 The statement was a response to claims by Bigfoot�s (the truck) legal team that Sasquatch was only seeking to profit from the suit. Weekly World News was the first media source to break the story of the plans for the suit. Over the course of the past 7 years the Florida publication has become the leader in Bigfoot related stories. �I would like to thank Weekly World News for the generous positive press that they have given me over the years. They had to take heat for years because of me. Many people were critical of the paper because they refused to provide concrete evidence of my existence. They honored my wishes in that regard so faithfully that now it is my turn to honor them,� Sasquatch said in a written statement released yesterday.